It’s been a bit of a struggle today. Rain and fatigue are working in concert against me, but I wanted to get a post in. We have a yellow jacket staring us in the face here. I think this was mid-clean, hence the protruding mouthparts behind the mandibles. This photograph is a bit old, from a series I took a few autumns ago, where the honey bees and yellow jackets with a few bald-faced hornets and paper wasps thrown in for good measure, were enjoying the fruits of the pear trees’ labor. For me, these wasps and bees (you can throw in the bumblebees into the mix, too) on the goldenrod, along with grasshoppers and sulphurs in the tall dead or dying grass (in addition to the red dragon from yesterday) signal the tail end of the bug season. It is autumn in earnest. We haven’t quite gotten there yet, the end that is, but we’re close. Kind of how we are to this wasp. On the edge, we’re staring danger and death (winter) in the face. Well, yeah, not really. As I’ve mentioned many times, here and there and to anyone who lets me talk about insects and insect photography, I used to be terrified of bees and wasps. Yellow-jackets carry one of the more nasty reputations among stinging insects. I fortunately have not had to bear witness, but my understanding is they live up to their reputation if one gets even a little close to their nest. Knock on wood, I won’t learn the hard way. In spite of that mean streak, they seem to be fairly average in relation to other wasps in other situations: flying around, feeding, searching for food for their offspring, etc. This particular wasp was quite placid sitting on a dead leaf, quite apart from tales of an angry swarm. This shot is not cropped, so I had to come very close; but the wasp was nonplussed, and I fired off quite a few shots, thank you, your Waspiness. I wouldn’t go as far as saying they are teddy-bear-like jumping spiders: they won’t be invited to jump on my hand or camera lens; in fact. you’d probably see me doing the jumping and it would be backwards (some scars always remain, I guess). But in my experience, they ain’t mad. 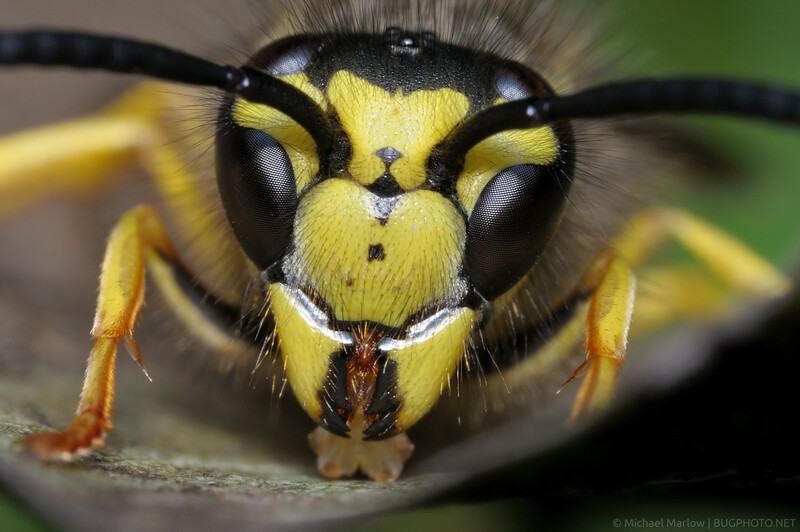 Posted in WaspsTagged angry, autumn, hairy, Macro Photography, stinging insect, Vespinae, yellow jacketBookmark the permalink. Seriously, do you take a bad photo? Kidding, I know you have to take a 100 to get the one, but wow, you sure do get them!